We will be revising 2D and 3 D shape. Your child needs to be able to name the shapes and identify their properties. Look for shapes in your home and when you’re outside, discuss why particular shapes have been used for a specific purpose. For example talk about why beans are in a cylinder. This month we will be learning all about managing money- how to budget and plan for different bills. We will be visiting the Bank of Ireland to see how our money is managed in the bank. We will learn about taxes, bills and monthly payments. The children will have the opportunity to open a savings account and learn about the cost of borrowing money to buy bigger items. We will learn about credit cards and debit cards. We will hopefully gain an understanding of the difference between needs and wants. Working to a given amount of money children will learn to plan a budget. They will calculate monthly payments on big items and plan for saving too. This month we will be looking at area including compound shapes. Have a go at these activities. This month we will be revising measure. We will learn how to use measuring instruments and read different scales. Try this fun on line activity at home, measure the parcel then read the table to select correct stamp. If you are cooking allow your child to weigh ingredients or estimate and measure the size of a room. Estimate and measure distance using a variety of measuring instruments. Calculate scale used on measuring instrument. This month we will be looking tessellations. Try these games at home. 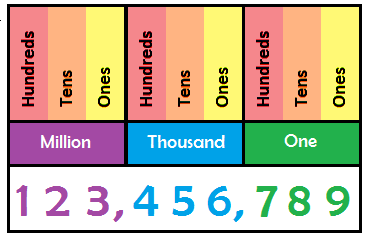 Place value runs through the entire maths curriculum. It is important that children understand the value of each place. Understanding place value means that the children can read big numbers! When reading big numbers there must be an emphasis on the comma separating the places. During the month of October the children will be working on a number of problems relating to percentages. Percentage are all around us and calculating a percentage increase and decrease is an important life skill. Encourage the children to calculate sale prices in shops. They shoould be able to calulate simple percentage decreases on the spot as they are familiar with 10%, 20%, 25%, 50% and 75%. If the children are watching the news as part of our 'It's a disaster' topic they will also hear about perecentage rises. This month, Primary 7 will be completing work based on symmetry. Symmetry is a challenging area of mathematics and some children find it difficult to visualise a reflected pattern. Children should be encouraged to use a mirror to help them reflect patterns and shapes. At home the children could be challenged by the printable sheets (which can be accessed on the right), encourage the children to reflect the colours in a pattern. Matheletics is also a fantastic resource to challenge the children with more difficult symmetrical patterns. The children will be consolidating their knowledge of coordinates in the first quadrant. They will also be extending their knowledge of negative numbers, through coordinates in 4 quadrants. There will also be an opportunity for children to create their own coordinate pictures. They should remember that (x) is a cross and (y) wise up.